Tonight I went out for dinner with Anzia and as usual she chose to go to the Wayward Cafe. When we go out the deal is that she gets to have whatever she wants as long as she eats it all or no dessert and Wayward’s menu is an eight year old’s dream. What did she have you ask? Pancakes and breaded mozzarella sticks, of course! It was delicious, just ask her! We decided to bring dessert home to share with Daddy. Did I mention, I love dessert at Wayward because they usually have two things that I don’t make very often, pie and cheesecake. Tonight we got one of each, because they had at least five amazing choices. 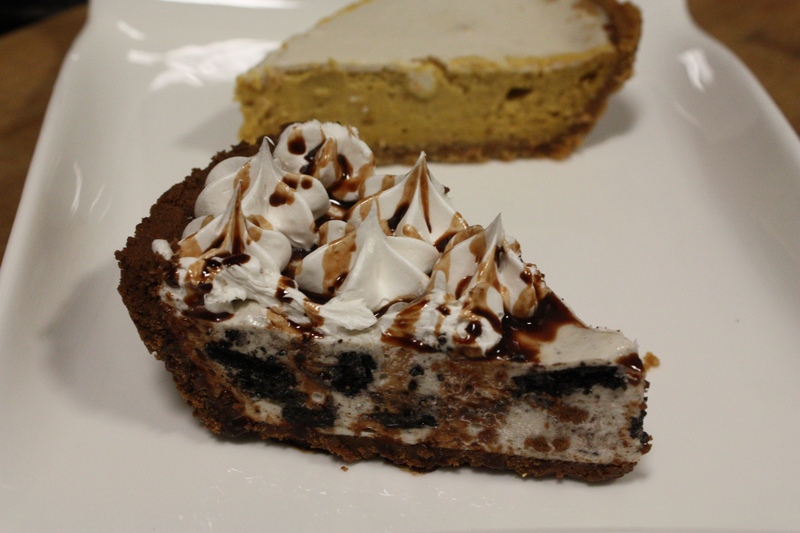 we chose the Oreo Pie and Pumpkin Cheesecake. WOW! They were amazing! While I was eating I had the idea to find out if any of the amazing vegan bloggers out there had tried making either of these varieties before. Finding the Oreo Pie was surprisingly difficult. The closest thing I came across was on Scrambled Dregs and for this years MOFO they made an Oreo Pie. Pumpkin Cheesecake had been played with a few times. One option was by Isa Chandra over at Post Punk Kitchen with her Pumpkin Cheesecake with Praline Crunch Topping. This raw version also looked awesome from Vegangela with a Raw Vegan Pumpkin Cheesecake. The recipe that looked most similar to what we ate was from Tofu n Sproutz with simply, Pumpkin Cheesecake. Do you have a favorite recipe for either of these? Gallery | This entry was posted in An Ode to Vegan Bloggers MOFO 2012. Bookmark the permalink.